See the commentary in the Colorado Independent by clicking here. Boulder is the 17th wealthiest city in the 57th wealthiest county in the 10th wealthiest country in the world. One would expect such wealth would relieve Boulder residents from the horrors of the Third World. However, no amount of CrossFit gyms or organic bone broth can provide one of the bare necessities for human survival: shelter. While most Boulder residents have never once had to experience the anxiety of not knowing where they will sleep on any given night, hundreds of Boulder residents live this reality every day; they have nowhere to rest, socialize, cook, sleep, and most importantly, escape the harsh cold. 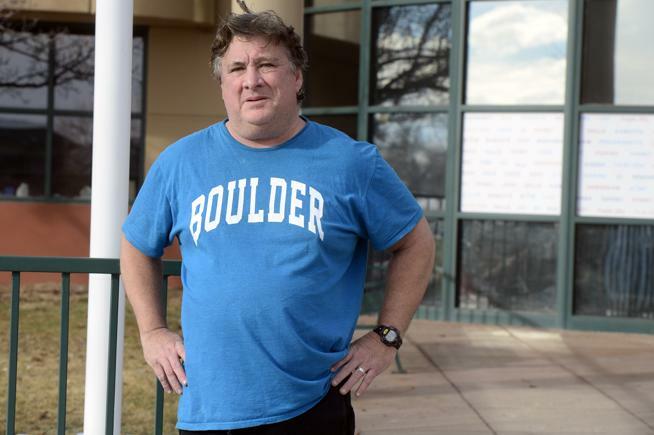 Benjamin Harvey was one such Boulder resident experiencing homelessness. He couldn’t afford the city’s skyrocketing rent and found himself staying at the shelter. One fateful day, Benjamin had the audacity to pick up his mail a few minutes past the arbitrary 6-8 a.m. mail pickup window, and with the same frustration you and I experience when facing the frivolous bureaucracy of the DMV, tapped his hand on the shelter window. The punishment you or I would face for such an egregious outburst would be a side-eyed glance at best, but for Benji, this understandable display of emotion was quite literally a death sentence. Our neighbor froze to death on Christmas Day because he was turned away from the shelter for his violation, despite being recommended to the shelter by the city’s emergency relief service, Coordinated Entry. It goes on, but you get the drift . . . It’s the same old lack of personal responsibility by homeless people themselves and finger-pointing at those in authority always being peddled by the socialists in Boulder. And I don’t quite believe the version of events involving Benji Harvey as presented above; I went there almost every morning for about a decade to shower, and I saw plenty of obnoxious and even violent behavior from homeless men and women which needed to have consequences, including being banned from the facility either temporarily or permanently. Such measures could have been employed more often than they were, in my view. ‘No more dead bodies on Boulder streets’ is certainly a catchy title, but if the author is serious he’ll join me in urging the homeless men and women in that city to stop their self-destructive behaviors. And while they’re at it, they could also stop stabbing each other. In any case, it’s long overdue to stop exploiting the death of a homeless man on Christmas morning of 2017. I met him a couple of times, and he was out-of-control intoxicated on both occasions, to the point that I told him to get off the corner of N. Broadway & U.S. 36 with his silly cardboard sign before he made all of the typically generous passersby angry. I thought at the time that I’d be seeing his name in the news, found dead from alcohol poisoning; as it turns out, his BAC was only a contributing factor to death by environmental hypothermia. Who am I to opine on homelessness and homeless people? I’m someone who lived outdoors year-round in Boulder, CO and its environs for a decade after arriving in early 2008. I was never a drinker nor a drug abuser, never got a ticket for anything and had a friendly relationship with law enforcement officers from several agencies, practiced good personal hygiene, and most significantly I never became a dependent of government social services and private nonprofits. Friends I made in the broader community, residents of the neighborhood I lived in, passersby when I was respectfully panhandling, and readers of my blog all donated cash, food, clothing, hygiene items, books, etc. for my benefit over the course of those many years. I also made it a point to never segregate myself into any so-called homeless community, where it’s so perilously easy to develop an entirely negative Us-Against-Them outlook. Nobody but the homeless themselves are hurt by this, and yet the self-styled homeless advocates reinforce this sense of isolation. Of course, the high-profile advocates have no firsthand experience of the lifestyle, and are just regurgitating Far Left talking points. They do not now speak, nor have they ever spoken, for me. At times, the do-gooders’ drivel makes me chuckle. At other times, when I see more shameless exploitation of a poor deceased homeless guy, I become angry, This isn’t good for my health, as I’m residing now in a long-term care facility after a heart attack and some other serious medical issues which overtook me in December, 2017. Thus, I vent by writing. Thanks for your time! BTW, I’m not a socialist like the author of the commentary I’m replying to; I’d label myself a libertarian (small “l”) who votes for the candidate rather than the party. If you ever want a real homeless man’s perspective, rather than that of a poseur, I’m available. This entry was posted in Homelessness, Only in Boulder, Politics and tagged Colorado Independent, Jamie Morgan Boulder County Socialists on February 28, 2019 by homelessphilosopher. Well, that T-shirt alone ought to disqualify anyone. Read the Daily Camera article here: Two residents suing Lafayette over council selection process, alleging they were passed over for being white. Pictured above is Andrew O’Connor, who apparently doesn’t know what city he lives in. The other litigant, Cliff Smedley (seen below), I remember from his overbearing involvement with the activist group Occupy Boulder way back in 2011. He lived in Lafayette at that time, too, and also seemed a bit confused about where to put forth his efforts at Saving the World. We had many interesting exchanges about the Occupy Boulder movement on the now-defunct Daily Camera comments forum. This frivolous lawsuit just goes to show how much our country needs serious tort reform . . . Maybe these two old white guys should move to Boulder and run for city council in that city. Although their skin color might again work against them, that would seem to be the place where their hearts dwell. This entry was posted in Only in Boulder, Politics and tagged Lafayette (CO) City Council on February 28, 2019 by homelessphilosopher. We can expect the so-called Right to Survive, Initiative 300, to suffer a crushing defeat at the polls in May as well. Nobody wants homeless campsites set up at random anywhere in the city’s public space; nobody but the worst-behaved transients with no respect for themselves, no respect for other homeless folks, and no respect for the broader community. This entry was posted in Homelessness, Politics and tagged Denver bums on February 28, 2019 by homelessphilosopher. Second Amendment sanctuary; we need more! These grandstanding Democrats blaming inanimate objects just turn my stomach, and I can’t decide if they’re more sanctimonious than stupid. Maybe equal parts of both? Agreement could be reached on reforming involuntary commitment procedures, I’m sure, but that’s not hip and trendy for the Dems like being anti-gun and anti-gun owner. This entry was posted in Politics on February 27, 2019 by homelessphilosopher. They ought to teach this in public schools! This entry was posted in Politics and tagged truth about socialism on February 27, 2019 by homelessphilosopher. 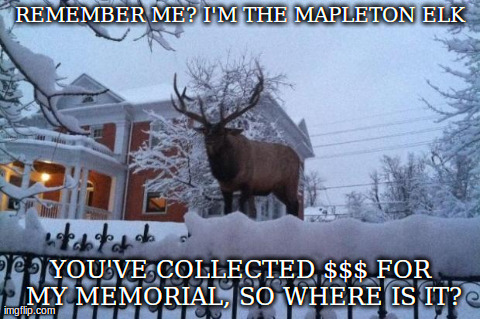 It’s been five years; has anything happened with the proposed memorial to the Mapleton Elk? Maybe I missed this in the news, or maybe it just faded away and the donated money was instead given to other causes in Boulder, CO. Anybody know for sure? I realize a life-size bronze statue of the critter would be prohibitively expensive, but couldn’t they at least have bronzed a trace of the Mapleton Elk? After all, there was a candlelight march and vigil on Pearl Street Mall . . . I hope the Buddhists didn’t abscond with the money! This entry was posted in Only in Boulder, Politics and tagged Mapleton Elk Memorial on February 27, 2019 by homelessphilosopher. Stood by the entrance to the shower area for an hour this morning, waiting patiently, then they tried to sneak somebody in front of me. I expressed my extreme displeasure without using a single cuss word. The state ombudswoman I contacted hasn't visited Hungry Asylum yet. WTF? Crusty Dave is away from here, presumably at the wound care clinic. He’s supposed to be visiting some assisted living facilities in the Broomfield and Lafayette area soon, but since he’s still so helpless and needy with the daily chores of living it’s possible nobody will be willing to accept him. The man spends at least 22 hours each and every day lying in bed, with a bright light on and his TV tuned into sports. Staff here continues to wait on the BUM hand and foot. At least I enjoyed some tomato soup with chunks of Monterey Jack cheese in it for lunch, along with a double cheeseburger made from BIG hand-formed patties. ‘How did the Easter Islanders use you?’ asked [Dr.] Stephen [Maturin]. There’s entirely too much broccoli served at Hungry Asylum, but I have been able to identify all of the meats. So far . . . This entry was posted in Elms Haven in Thornton, Politics and tagged Aubrey / Maturin novels, Crusty Dave a.k.a. World's Laziest Man on February 26, 2019 by homelessphilosopher.